"I am wondering, what tempts me in the very private places of my heart? If I were honest about the ways the devil has a hold of me, would my temptations be the same ones Jesus resisted?" If the most common Lenten practice is giving up things that you love, I’ve already had my Lent. Due to some recent health issues, I was on a ton of medication that required food restrictions. No coffee or tea, no chocolate or alcohol, no dairy, even lactose-free, no citrus, no berries, and nothing hard to digest. So, I’ve about had it with food restrictions. I think my husband would ban me from Lent if it was going to be about giving up a beloved food. I’ve tried to be valiant and accepting, but I’ve been cranky and he’s been patient. As I am pondering the approaching of this Lenten season, and gosh it seems too early, (I still have a small pile of Christmas stuff that hasn’t made it back into the attic yet), I am wondering, what do I want Lent to be about this year? What do I want to/need to focus on? How can I use the gift of this Holy Season to be more intimate with God? We celebrate Lent, as I understand it, for two reasons: as a reminder of Jesus’ forty days in the wilderness immediately after his baptism, and as a way to prepare for the celebration of his passion and resurrection. For forty days after his very public baptism by John, Jesus was in the wilderness where he could be very private in his relationship with God and the Holy Spirit. Matthew 4: 1-12 tells us that after forty days of fasting, Jesus was tempted by the devil in three ways. When he didn’t succumb to the Tempter, the devil finally gave up and Jesus was ministered to by angels. I am wondering, what tempts me in the very private places of my heart? If I were honest about the ways the devil has a hold of me, would my temptations be the same ones Jesus resisted? First hunger. Then self worth and the desire to be special. And finally, status and greed. I am going to be as honest and vulnerable as I can here. At least I can do that for Lent. I’ll start with the first one. Hunger and food. I love food. I love to cook, to eat, and to entertain. I love the whole process, the planning of the meals, the chopping and delicious smells, the serving, and even the cleaning up. Because I have hypoglycemia, I also eat frequently. Not a lot. But often. So food is a big part of my life. And having my choices limited makes me cranky. I am not proud of this. I am spoiled. I know it. I am prayerful about how my actions affect the world hunger situation and I have become intentional about giving more money to organizations that feed people. But food restriction creates major temptation for me. Would I have turned the stones to bread if I could have? Guilty. Things get worse for me with the second temptation. Would I want to prove to the devil my identity and my specialness? Ha! Let me show you just who I am connected to. I know this person and this person and this person. And that makes me special. I remember a woman asking me when I lived in Greenville, South Carolina, “Who are your people?” (Disclaimer: This question is not asked on Long Island where I grew up.) “Who are my people?” What? Oh, how special am I? Who am I connected to? To whom do I belong? Am I worthy of your time and attention? Much of the culture we live in today revolves around this temptation. If you’re one of us, if you know that right people, you’re in. Oh the temptation to prove that I am special. Jesus, you’re killing me. I wish I could at least get a gold star on one of these, but the third temptation, for status and privilege, for kingdoms, is at least as strong in me as the other two. I don’t have tons of money, but I have enough. I have enough to put some away for the future and enough to own a house and buy the food of my choosing. I have enough to take vacations and buy gifts for people. So truth be told, I have more than enough. And yet I have angst about money. I have been told the same thing by every spiritual director I have had and every spiritual guru with whom I have consulted. “Don’t worry about the money. It will all work out.” I am better than I was, but still not temptation free. I have episodes of worrying about money. Flare-ups, I call them, when the “I don’t want to be a bag lady when I grow up” voice in my head starts yelling in me and I am no longer peaceful and content and living in the spiritual abundance I usually experience. When this happens, I feel defeated. And you don’t have to tell me about the lilies of the field. I’ve read it a million times. I also know that Jesus talks more about the evils of money than he does about anything else. My head knows all of this. My heart is remedial. My head wants to be certain. And I know that is impossible. So would the promise of kingdoms, of endless supplies of money tempt me? Strike three. So I fail all three temptations. Not that the Spirit hasn’t been at work in me for years, transforming me and relieving me of the burdens of these temptations. I am better. Moving in the right direction. Bearing new fruit. But each Lent, this Lent, I have a chance to become more intimate with God, more faithful, more honest, loving and compassionate toward myself, and therefore more capable of receiving the message that Easter will bring. Love wins. Thank God for another Lent. Amy Sander Montanez, D.Min., has been a licensed professional counselor, licensed marriage & family therapist and spiritual director for over twenty years. She blogs weekly at Amy Sander Montanez. 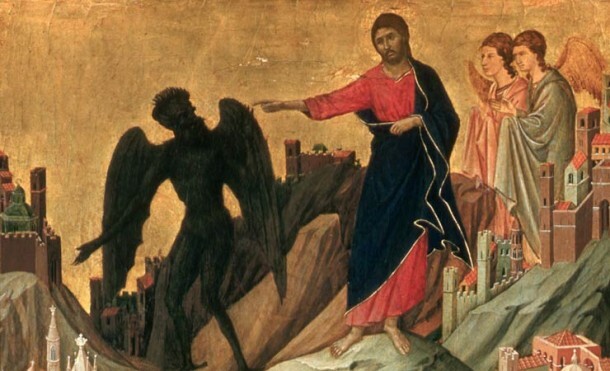 Image: "The Temptation of Christ on the Mountain" Duccio di Buoninsegna, 1255-1319 (Frick Collection, New York).